A few people have told me that I shouldn’t go to the Legislature and just vote “no.” My goal in the Legislature is to work for and fight for the people of Arizona. In a Legislature that is controlled by right-wing ideology, that often translates into trying to stop bad bills from becoming law. In the 53rd Legislature, being the voice of the people meant fighting against corporate tax giveaways, stingy TANF benefits, English-only insurance contracts, risky pension fund investments, untested technologies, diminished workers compensation benefits and workers rights, financial deregulation, misleading insurance contracts, environmental degradation, bad water policy, increased debt, increased sales tax, and more. Thankfully, there were many others– often on both sides of the aisle– who disagreed with these bad bills and also voted “no” to stop them. A reporter recently told me that, historically, Democrats in the minority make deals with Republicans and vote for Republican bills in exchange for votes on their bills. 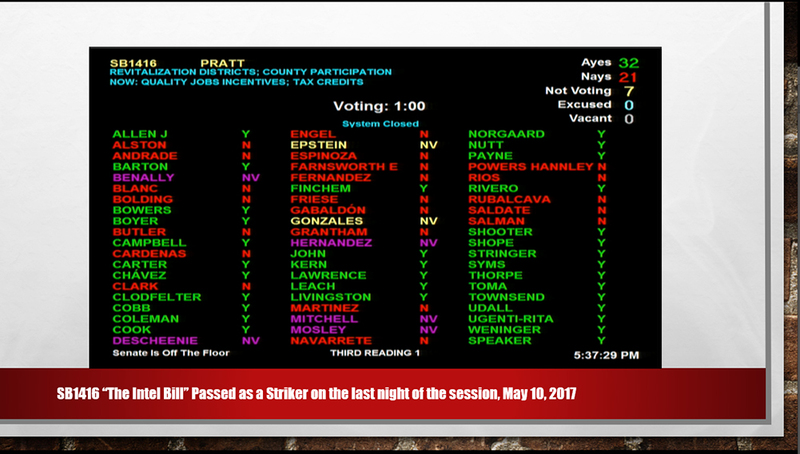 I have seen this vote-trading up close and personal in the Arizona House. I have been lobbied by other Democrats to vote for bills I disagree with– like the bill that would have classified home health workers as not real employees. A Democrat asked me why I was voting “no”. First of all, this bill conflicted with federal law and could get us sued. (It’s a total waste of money to pass laws that will cost us millions in court battles.) Other than that, why would we vote for a bill that diminishes the rights of workers, who are already underpaid and who suffer from wage theft? The only reason I can see for classifying these workers as “not employees” is to further screw them on wages, benefits and travel time from one home to another. Trying hard to get me to change my vote, this Democratsaid, “They’re just leased employees”– as if that status makes them less deserving of worker protections. When you stand up for the people, and you use your debate skills and tough questionsto change minds and votes, that’s a good thing. Going bold and arguing against bills that are morally wrong is more important than groveling for Republican favor by giving away your votes in exchange for the opportunity to pass a small-scale, safe bill that the GOP doesn’t care about (or wants to use as a striker later). In the 53rd Legislature, there were times when “reaching across the aisle” actually meant voting “no” on Republican bills. As Legislators, our goal should be improving the lives of all Arizonans– not featherbedding corporations and special interest groups. Here are the two videos from the Stop Thief! tax forum. Dr. Friese’s talk sets the stage on revenue. My talk focuses on specific tax giveaway bills, including which bills passed and which ones died. Here are a few of the slides showing the bipartisan votes on the corporate tax giveaway bills. The “Greenhouse Bill” was one of the first corporate tax giveaway bills to be heard in 2017. 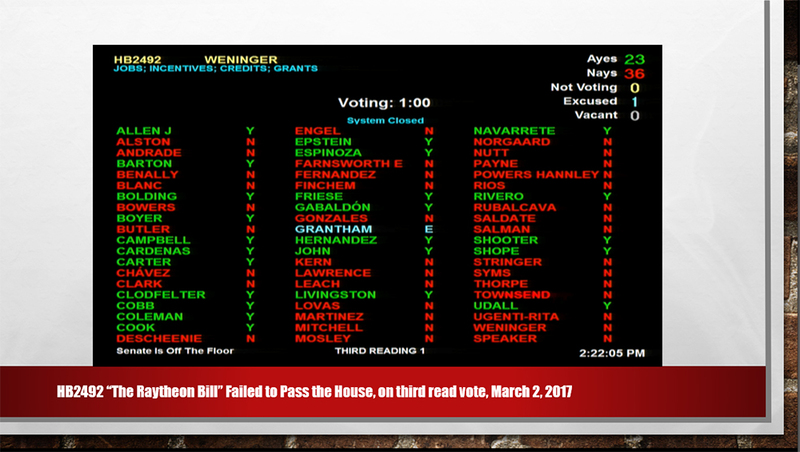 It went down on a bipartisan urban/rural vote because it would decrease funding to rural schools. The “Raytheon Bill” was a massive, multi-layered corporate tax giveaway that would have helped only a handful of Arizona’s largest employers. It was soundly defeated on a bipartisan urban/rural vote. The “Intel Bill” was a scaled back version of the “Raytheon Bill.” It came back on the last night of the session as a striker and passed with much arm-twisting. 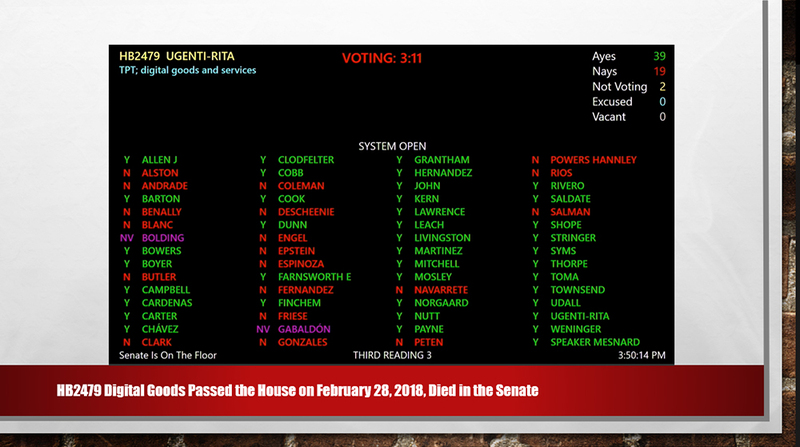 When you compare the “Raytheon Bill” vote (above) with this vote, you can see how many votes flipped between March and May, after the story broke that Arizona gives away $13+ billion and uses only $10 million to run the state. The tax exemption for digital goods and services passed the Arizona House before we even knew how much it would cost the general fund. After the projected $140 million per year price tag was revealed, it died in the Senate. The cost of this bill would have increased every year as more goods and services are purchased online. 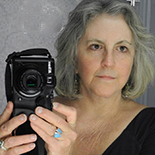 This entry was posted on August 3, 2018 by Pamela Powers Hannley in 2018 elections, Arizona, Arizona Legislature, Economics, economy, education, jobs, Pamela Powers Hannley, Randall Friese, Robin Hood Tax, Sustainable Economic Development, taxes, Trickle Down Economics, War on Poverty and tagged Arizona Legislature, PALF, Pamela Powers Hannley, PDA Tucson, Randy Friese, tax cuts, taxes.